In 1941, MGM released Two-Faced Woman to disaster - at least as far as Greta Garbo was concerned. She may be the only actress who made the transition to sound from the point of view of the audience and critics, but not from the point of view of the actress herself. Garbo was uncomfortable with her speaking roles and relished the silent pantomime with which she gained her fame. She was also uncomfortable with the comedies MGM were sending her way and abhorred her work as a George Cukor clown. But perhaps her biggest discomfort was with the costume design studio executives were foisting upon her. She didn't have a beauty pageant figure, yet they insisted on bathing suits and evening gowns that required such. Although she had worked with the legendary Adrian in the past, the fashion missteps during the filming of her last picture ended their friendship. Garbo walked off the studio lot never to act again. Adrian walked off the lot as well and remarked: "It was because of Garbo that I left MGM. In her last picture they wanted to make her a sweater girl, a real American type. I said, 'When the glamour ends for Garbo, it also ends for me. She has created a type. If you destroy that illusion, you destroy her.' When Garbo walked out of the studio, glamour went with her, and so did I." 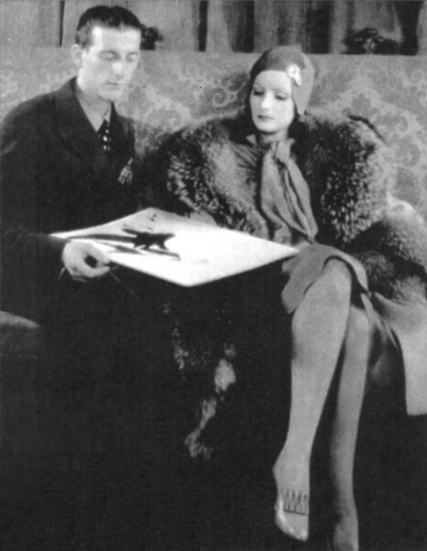 According to Karen Swenson in Greta Garbo: A Life Apart, "In a July 1941 column, Hedda Hopper described the innovative fashions Adrian had designed for Garbo, complemented by the finest furs and jewels: 'One gown, which she wanted to wear but the Hays office banned, is so beautiful. It's made of suntan souffle over the same shade of lining, gathered skirt, gold-lace belt with lace coming up the front....Strange, isn't it, that a girl who cares nothing about clothes has created so many outstanding fashions?'" Swenson goes on to explain: "A disagreement over this very costume precipitated a conflict with its designer. Production executive Bernie Hyman, backed by the front office, wanted to scrap the glamour and bring Garbo down to earth; Adrian objected." The cinematographer Joseph Ruttenberg could see Garbo's distress. "I don't know why she took Two-Faced Woman," he said. "It wasn't a good story to begin with, and it wasn't a Garbo picture." Swenson continues with his story: Garbo "didn't have a very good bosom and during that picture they spent months making gowns for her to make her look beautiful and dressed up." Producers were in disagreement over the gown she was to wear in the nightclub scene. Swenson explains, "Cukor summoned Ruttenberg to the wardrobe department where he and Adrian were assessing a decollete dress. 'Isn't that beautiful?' Cukor said." Swenson tells us that Ruttenberg didn't agree: "Well, it's a beautiful dress but..." The star finished the cinematographer's thought. "You don't think it's very good looking for me," Garbo said, and Ruttenberg nodded. "Joe, these things here," Garbo added, "this is God's. I'm not responsible." Adrian masked the gown with jewels, Swenson tells us, but Ruttenberg never liked it. "Every time that Garbo would bend over, the dress would come out and you'd see the bosom," he said. "If she was sitting still during a scene I could do something...I'd get a low shot set up and have a wine glass cover it up. This was fine...but when she was dancing there wasn't anything you could do." Garbo appears to have been humiliated by the film, her performance, and the fashion disasters during production. Years later, the story goes, Adrian shared a little secret. When he told Garbo he was leaving MGM, she told him: "I'm sorry that you're leaving but, you know, I never really liked most of the clothes you made me wear." This was no doubt a disheartening moment for the man who had been designing costumes for films since the early 1920s for such legends as Irving Berlin, Joan Crawford, and Rudolph Valentino. All was not lost, however. Adrian went on to found his own design house and continued to work with Hollywood, receiving awards from Coty, Lord & Taylor, and Parsons.